Imagine a life where you get paid to be surrounded by expensive alcohols, hot gorgeous women and the heart of any party. Of course, getting Hugh Hefner in TNM is still a task we aim to achieve in a few years down the line. The closest thing that fits the profile is the life of a bartender. Is the occupation as fun as it seems? Do you really drown in alcohol and women? 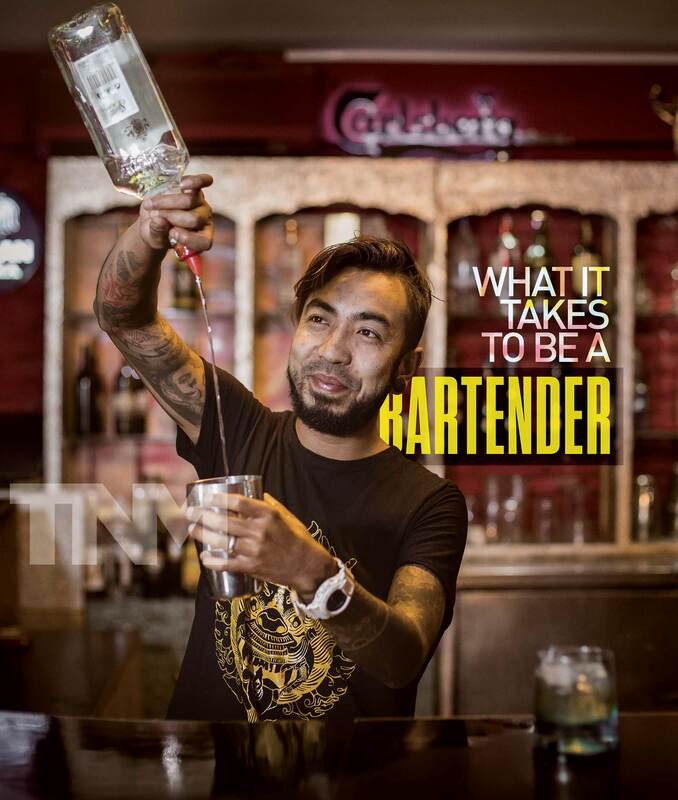 We talk to Pramod Shilpakar, the jazziest bartender from Isis Restro and Hookah Bar from Thamel to know what it takes to become a bartender. 1) How did you get into bartending? Was it something you always wanted to do or did it just happen? I guess it just sort of happened. While I was studying back in Singapore, I worked in a bar. As the days passed, it grew onto me and I started enjoying it more and more. I liked being creative and having fun with my work. Meeting different people keeps things exciting. I’ve been in it for the past eight years and I don’t plan on stopping any time soon. 3) What did you do before bartending? Nothing special, really. I was just an ordinary college student who had more fun than studying. 4) Did you attend any course for professional bartending? Tell us a little about it. At that time, I was studying hospitality and tourism management and working in a bar as a bar assistant as well. Luckily, my boss took a liking to me; he found my cocktails were pretty good so he promoted me to a bartender within a couple of months. For me, it was work and training at the same time. 5) What does it take to become a professional in this field? You should know your spirits n liquor. Then it’s all about knowing the proportions and procedure to mix the drinks, how to handle the bar customers. Being pro active and having a sense of humor really helps as well. 6) Is it okay to drink while in the job? Have you ever been drunk in working hours? It depends on the management and its policy. Having a drink is acceptable, but there’s no way you can be drunk on the job. 7) What are the perks of being a bartender? And what are the difficulties that come along with it? You definitely get to know many people and you get to socialize. When you’re visiting other bars, you might get a free drink if they know you. Excel at what you do and you can even earn a handsome amount. Of course working in a constant state of noise can be stressful. Late night shifts harms your body, while your friends are having fun you have to work. Working hours aren’t always suited for everyone. And you can forget about getting days off on special occasions. 8) How do you deal with annoying or drunk customers? What is the most annoying thing that people do to annoy you (a bartender)? The best way to handle annoying people is just to ignore them. As soon as you see them, just pretend that you are busy or sneak out to the washroom. I get easily annoyed with people who ask for discounts and start to bargain. It’s like dealing with a drunkard who comes to buy vegetables in the market and wants the cheapest rates. And drunk people can be very abusive as well. 9) Is there a moment/experience while you were bartending that you will always remember? 10) Which is the most difficult drink to prepare and what are the skills required for it? Every drink has to be perfect and there are a few strict procedures to make drinks. Personally, I think the Flaming Lamborghini is a pain, since you have to built a tower out of the glasses and flame it all the way. It’s risky; sometimes you might burn the customer’s face. You have to be extra careful. 11) Does being a bartender help in getting the girls? (Laughs) This one took so long to answer but yes… maybe. 12) Which is your favorite drink? I have always enjoyed making Bloody Marys. It’s simple, edgy and the ingredients are few of my favorite as well. 13) Do you receive tips? What is the biggest tip you’ve ever received? I have received a few tips, but I still have not received one that increased my bank account by a huge margin.